The Building Research Establishment (BRE) recently gave its support to the Radon Tee World Trek, an international campaign promoting awareness of the naturally occurring radioactive gas, radon. BRE, which recently celebrated its 90th birthday and has been at the forefront of the practical aspects of radon for over 20 years, is an independent and impartial research-based consultancy offering advice to government, industry, businesses and individuals on all aspects of the built environment. 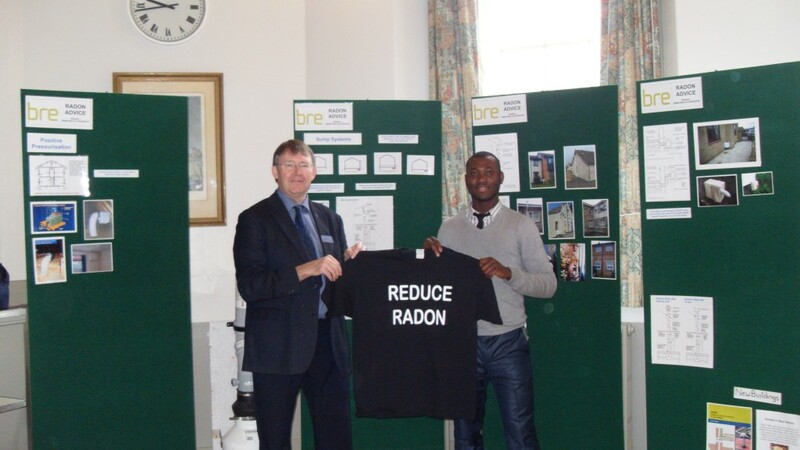 Chris Scivyer, Principal Consultant and Felix Ahatty of the BRE Radon Team both posed with Radon Tee to promote the “Reduce Radon” message. Their work at BRE includes research into the most effective methods of radon protection for new buildings and radon remediation for existing buildings known to contain high levels of radon. They can offer practical advice on radon barriers and sumps, passive ventilation and positive pressure systems and publish a range of technical guides on radon protection & reduction measures. The Radon Tee World Trek is an initiative that began in the USA in 2010 thanks to the charity Cancer Survivors Against Radon (CanSAR). Radon specialists, propertECO, brought the campaign to the UK and have been touring the t-shirt at events and seminars to increase social awareness of the second-leading cause of lung cancer. You can follow the progress of the international campaign at www.facebook.com/radontee.